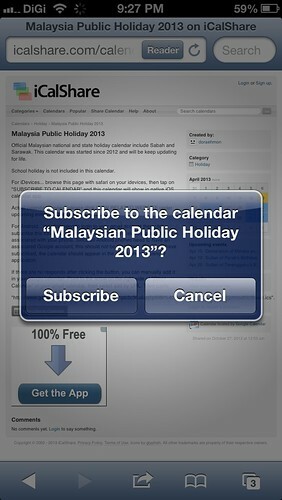 This is a very simple way to add all the public holiday in year 2013 in Malaysia. When the page is loaded, click the “Subscribe to Calendar” on the page. Tata! The calendar is now in your iPhone or iPad’s calendar. You can browse through the iCalShare website to find out the calendar that you are interested in. Thanks to “doraehmon” for creating and sharing this calendar.